World, I have a confession to make, please don’t be mad. Allanabytes is a little bit drunk right now. Okay, just a small buzz. But, I’m sorry to admit, the California wine has gotten the best of allanabytes and mamabytes. We’re on vacation, isn’t that cause for celebration?! I think so, and I also think it will make for a much more entertaining blog post. So, here we go. 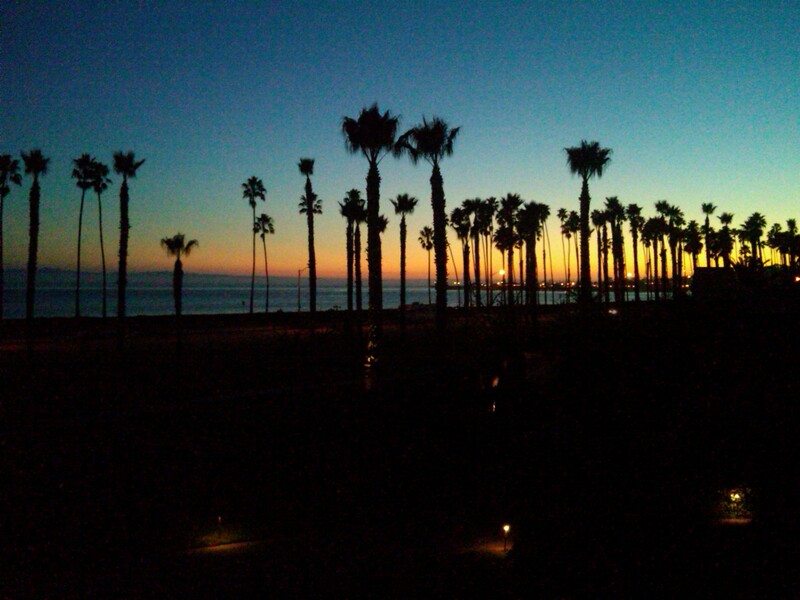 Let me just say, I am a smitten kitten with Santa Barbara, California. After spending basically the entire day traveling (we left our house at 8:30 a.m.,, didn’t arrive to CA until about 8 p.m. Chicago time), I couldn’t help but breathe a sigh of relief as we stepped off the plane and took our first steps in the California sun. I was completely entranced by everything Santa Barbara had to offer – the swaying palm trees, the mexican tiles spread over each roof, the crisp, gleaming white buildings and of course, our adorable twenty something cab driver, who was playfully donning a fedora that sheepishly covered his thick curls, black-rimmed glasses, and a plaid black and white scarf, seemingly oozing the epitome of California, exactly as I had imagined. Upon arrival at our hotel, my mom admitted that she had figured we would be too tired to make our 7:15 dinner reservation, and had assumed we would order in room service and a movie instead. “It’s vacation, we are goin’ OUT,” was my response. Besides, I had already scoped out the menu at the restaurant while waiting in the airport – I couldn’t turn back now. Good news Quartino, the wine is not cheaper than water in California! We headed over to Arch Rock Fish, a seafood joint near downtown SB. When we walked in and were greeted by a friendly hostess and a packed, lively bar, I was reminded of Quartino. The busy atmosphere, smiling faces, good food – ah, man am I glad I didn’t have to work tonight (hello Q staff, I love you all). However, my pleasant bubble was instantly shattered the moment our waiter announced they were sold out of artichokes. Damn, that grilled artichoke appetizer with lemon aioli did sound delicious. And if you know allanabytes or mamabytes, you know we love our artichokes. Lucky for us, they were not sold out of calamari, which, by chance, was served alongside a lemon aioli, heyoh! 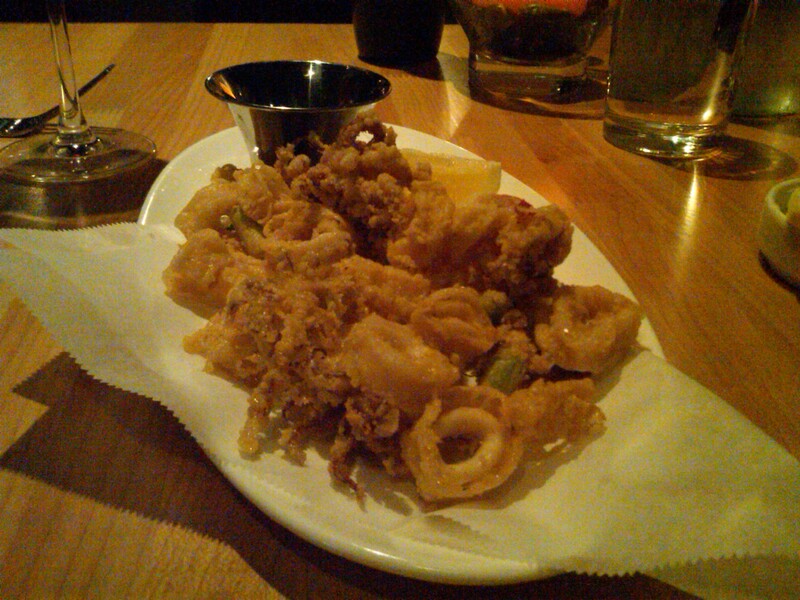 The greatest calamari I have ever ... ever ... ever, had. I’m very weird about my calamari. Actually, it wasn’t until this year that I really began to develop an appreciation for the dish. Suddenly, I started to crave fried calamari, all the damn time. I’m not sure if it was always the different array of sauces that came alongside the fried goodness, but it always happened that I couldn’t not order calamari if I saw it on the menu. So, to fill the artichoke-sized hole that was gaping in my heart, mamabytes and I devoured this stuff. I’m telling you – it was utter perfection. The breading was light, but not weak, fried but not crunchy. Crisp, effortless and damn good. Onto the main course. "You sound like you're from LONDON"
I know. More breaded, fried fish. But come on, allanabytes is on vacation! And I’m always hungry! 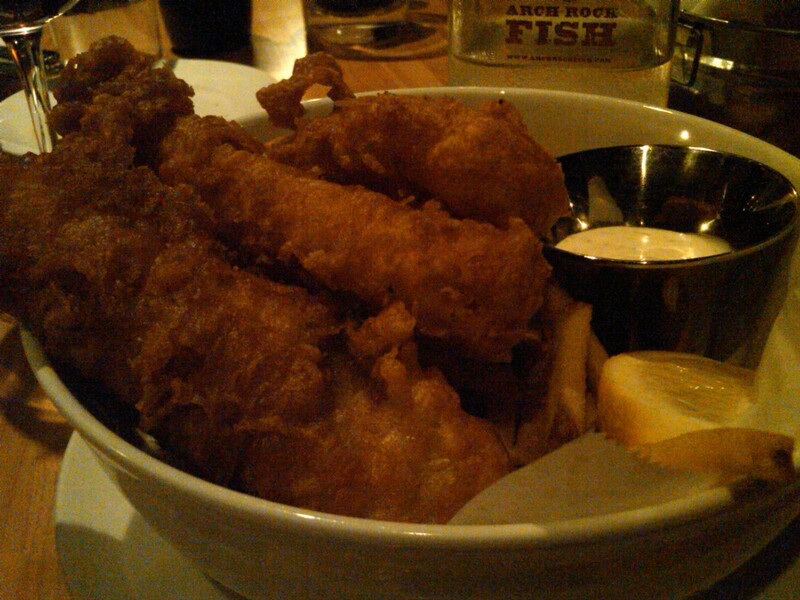 Plus, I’ve never eaten fish & chips before. And yes, I’m sure it’s a bit disconcerting that a self-proclaimed foodie like myself orders calamari, a butter salad (see, I’m healthy) and fish & chips for dinner on a Friday night, but, what can I say? The stomach wants what it wants. And what I really wanted … was dessert . Please, before I get started on how amazing this dessert was, forgive me for my photography. Keep in mind, I was in a dark restaurant with my blackberry. As lame as an excuse as that is, I’m sticking with it. So – I’m sorry. But I’m really not sorry for ordering dessert. After getting lectured by mamabytes on the importance of not ordering the entire menu when I’m out to dinner, I went with my instinct and ordered dessert. Sorry Robyn, no dessert tomorrow, I promise. 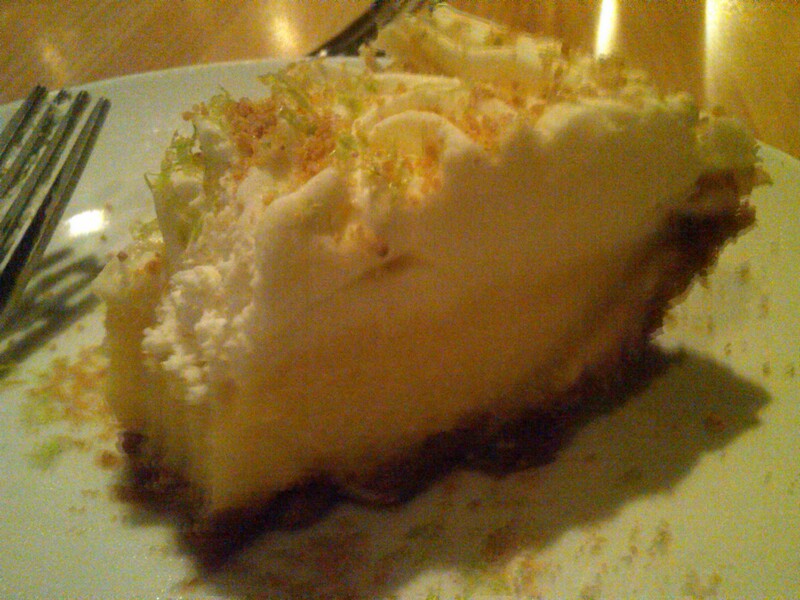 This key lime pie was tart, tangy, creamy and delicious enough to fulfill my dessert quota for the entire trip. Final word on the subject? 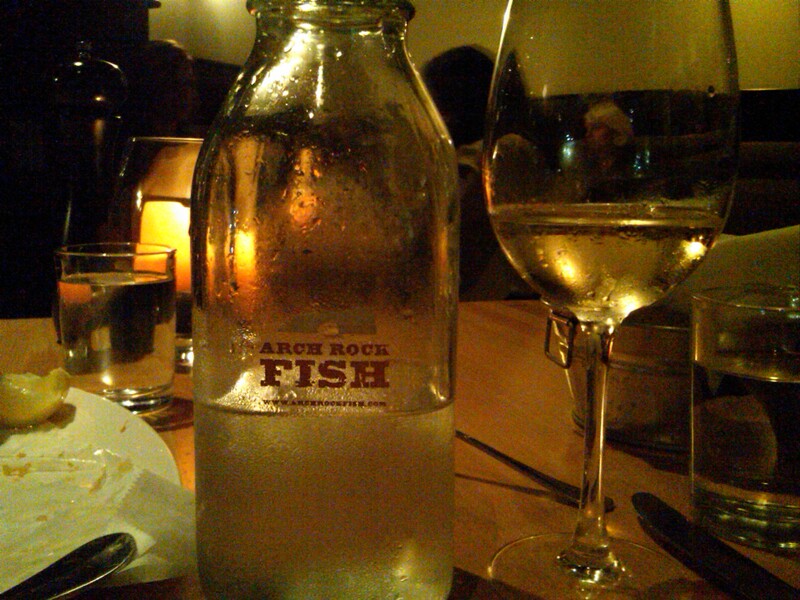 If you’re ever in Santa Barbara, CA – be sure to head to Arch Rock Fish for dinner. As delicious as our dinner was, however, I’m not 100% sure we will be welcomed back with open arms. Here’s why. Upon leaving, I begged Robyn to take one shot with me. It’s vacation! Plus, I had to distract her from how buzzed I actually was. Thanks to some sound advice from one of my favorite people, “the strategy is to get her back on the booze,” I urged shot after shot after shot. But she wouldn’t budge. So, as we leave, I ask the hostess to take a photo of the two of us, mother/daughter shot in front of the restaurant. Mamabytes refused again. So, I can’t stop laughing and I decide it’s a good idea to have a photo shoot … with the hostess. As Robyn is snapping away, she’s gleefully shouting “it’s your new best friend!” Ouch. I turned bright red, giggled, apologized, and ran out of the restaurant. Safe to say, I totally, one-hundred percent, without a doubt, creeped out the hostess. Typical. Till tomorrow! Allana, How have I missed this til now?! I’m not even a cook or food expert but I thoroughly enjoy your writing style! I’ll start watching for more – keep it up kiddo and tell momma I said hi!